For those wanting to ease back on meat, there are hundreds of vegetarian pasta dishes, from a simple tomato spaghetti to a lighter summer lasagne. 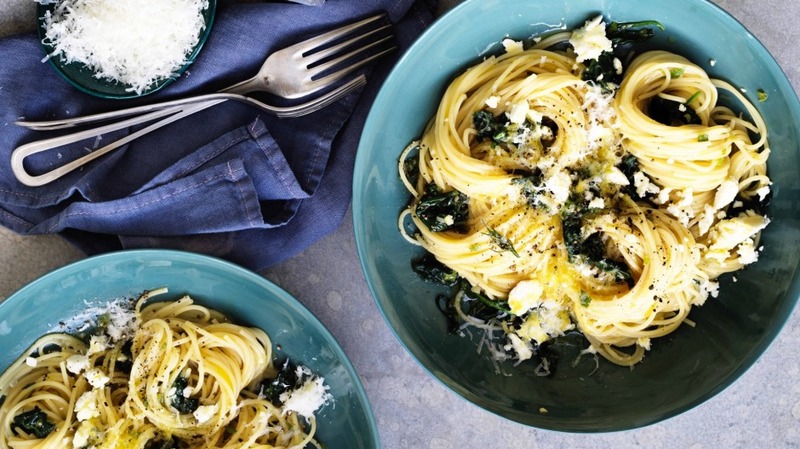 Here's a pasta twist on a Greek favourite. Bring a large pot of salted water to the boil and cook the pasta until al dente. While the pasta is cooking, heat a large frying pan over medium heat and add the oil. Add the spring onions and garlic and fry until fragrant and lightly browned. Add the spinach and nutmeg and season well with salt and pepper. Stir until the spinach is wilted, then add the butter. When the pasta is cooked, reserve ¼ cup of the pasta water and drain the pasta well. Transfer the pasta to the spinach mixture and add the eggs and reserved pasta water. Stir briskly until the eggs are set, about 1 minute. Stir through the dill and mint. Transfer to serving plates, scatter with the feta and parmesan, and grind over a little more pepper to serve. Or try this traditional spanakopita recipe instead.